May 8th: Welcome New Buyers & Vendors & Spring Veggies! Harvest of the Month is Mixed Greens! We have had a great supply of salad mix, kale, chard and more from Dutton Berry Farm, and will soon have more asian salad mix from Harlow Farm. New to the Market this Week: arugula from Duttons, as well as cucumbers, cilantro, bok choy, and lettuce from Old Athens Farm! New Vendor: Welcome to Ruth's Mustard - made at our wonderful partner Neighbor Made Kitchen in Keene! Check out the variety of mustard available by the 7 oz jar or gallon to suit your needs. New Buyer: Welcome to the Dublin School based in Dublin, NH. We look forward to delivering fresh, local products to you! Also Currently Available This Week: apples, carrots, celeriac, chard, kale, leeks, parsnips, potatoes, rutabagas, salad greens, turnips, herbs, and more! We also have delicious bread, bagels, yogurt, pudding, cheese, eggs, maple syrup, granola, sauces and local meat. Green Mountain Creamery Yo Yummy Update: Yo Yummy 12 packs are now available in each of four flavors, rather than mixed packs. You'll see them individually listed below and online. 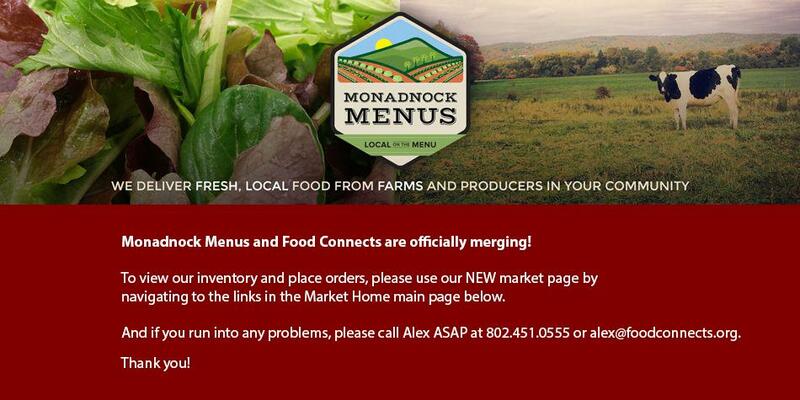 Social Media Reminder: Don't forget Monadnock Menus now has our very own MM facebook page Please visit and "like" us to help spread the word. If you would like to be able to share your organization's facebook posts please let me know and we can add you as an editor. May Harvest of the Month is Mixed Greens! Check out the website for some great recipes and free educational materials for your cafeteria or shop. We should have more and more greens becoming available each week! A classic marinade for meats-especially ham. Use as a spread or a dip. Add a little olive oil and use it as a salad dressing. Perfectly versatile and complimentary to all foods. A great spread, dip or marinade for all red meats and game meats. For black pepper lovers it's a "must-have". Use Ruth's Cranberry Mustard as a marinade for pork or poultry or as a sandwich spread. Mix with equal parts cream cheese for a tasty vegetable dip.